1954 was just a decade after World War II, during which time the Army Signal Corps introduced a method of printing - or etching - metallic circuit conductors on an insulator substrate, and thus was born the printed circuit board (PCB). The first boards used a phenolic-paper laminate, which is the shiny brown substrate material that is still found in some industrial applications like motors and control panels. Ferric chloride was used to etch away the copper foil not masked off with photoresist chemicals. I made many crude PCBs using a resist ink pen to draw circuit traces and component mounting pads, then etched away the exposed copper with ferric chloride purchased at Radio Shack. This line from the article is reminiscent of people who remarked similarly about the first televisions and computers: "One of the first questions that arises is: 'What good is it and what do I gain by using it?'" Printed inductors were already being used, as the photo shows. 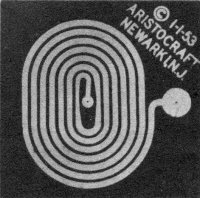 Back in the mid 1980s, I programmed an HP 85 computer, using HP BASIC (aka Rocky Mountain BASIC), to draw printed inductor patters in the engineering development lab where I worked for Westinghouse. A built-in thermal printer spit out the image on paper, and then the image was transferred onto clear acetate in a copying machine for use in the photoresist exposure process. Anyone else remember using one? Printed circuits and etched wiring, new items, subminiature capacitors, club news, and late trends. 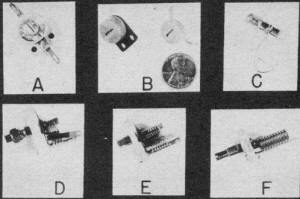 Examples of etched printed circuits. Although only 0.0014 often in. thick, 1/64 in. wide copper strip will carry 3 amps, 1/8 in. up to 15 amps. This is the first - and the first in print in our field, we believe - of a series of discussions and how-to-do-it chats on printed circuits, or etched wiring, as applied to model work. Just after World War II, the U.S. Signal Corp announced a new method of "printing," or, to be more exact, etching conductor lines on an insulated base material. In the past three or four years this method of making electrical and electronic assemblies has found its way into government and commercial fields, and recently into our own field of RC work. Basically, this is what we have: an insulated base of phenolic-paper laminate, upon which is a conductive layer of copper foil. This copper, which measures .0014 in. thick, is bonded to the base material under heat and pressure. The base may be had in thicknesses from .005 in. to 1 in. thick, although the most common sizes are 1/32, 1/16, 3/32 and 1/8 in. Commercially, a conductor pattern is imposed upon the copper by silk screening, stenciling or by means of what is known as photo resist. This pattern then forms a barrier, or resist, to the etching solution, which is ferric chloride. The ferric chloride solution eats away the balance of the exposed copper. The resist pattern is then removed by solvents or scrubbed off with steel wool and we have left the copper pattern such as seen in the accompanying photograph. The current given, based on .0014 in. thick copper, is that amount needed to cause failure of the copper by excessive heating. However, one half of that amount for a given size line is perfectly safe and is many times more than is needed for RC work. One of the first questions that arises is: "What good is it and what do I gain by using it?" The final product is the ultimate in neatness. Done commercially, each and every finished card is precisely the same, thus achieving a uniformity heretofore almost impossible. Coils can be made in this way and positioned in the circuit so that the inductances and capacitances involved are the same on each card, thus reducing testing time and de-bugging. Also, there are no loose wires to break or become entangled. We have in effect a "two dimensional" wiring layout. Components such as resistors, capacitors, etc., are then placed in position in holes which have been drilled in the small "lands" where connections are made to the conductor. Some manufacturers place eyelets at each point of soldering. Here we have a word of caution: do not use a heavy hot iron when making the solder connection. We've found the popular Ungar pencil iron with a 1/8 in. diameter tip in the 37-1/2 watt heating element to be an ideal iron. For solder we recommend No. 18 gauge Ersin 60/40 solder. This low melting point solder can be obtained from most radio supply houses or from Control Research. Begin soldering by first heating the component lead slightly and then touching the iron to the copper pattern at the time the solder is applied. Too much heat will cause the bond between the copper and base to break loose, or even blister the base material. When soldering a component into an eyeleted hole, such as is used on the North American receiver, it is important to make sure the solder flows not only from the eyelet to the component lead but also from the eyelet to the conductor pattern. Besides the conventional conductor patterns for receivers or transmitters, we also have, in this new medium, excellent means of making limit switches or rotary commutators or sequencing switches. In the past, segments were made by cementing thin pieces of brass, copper or tin to a base material. This method, while workable, is crude at best. Our new method is more precise. The bond strength between copper and the base is better and the copper segments are thin enough vastly to improve brush operation. We hope this gives you a little idea of the possibilities of this method of construction. Tune in next month for more design and some construction information. This month we continue our presentation of the various components used in RC work, with a review of miniature and subminiature variable capacitors for both receiver and transmitter work. Strictly speaking, not all of these are "new items," but are best grouped for the sake of clarity and cohesiveness. Variable lightweight capacitors, described in the copy. The size of these ultra-small units may be compared with the Lincoln penny, in center. 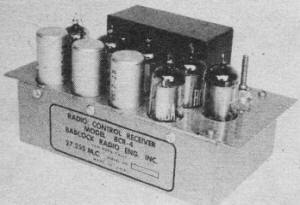 Six-tube receiver, three sealed relays. All controls, via compound, elevator trimmer. Much awaited multi-channel Babcock X-mitter. Note control stick, the right side of the case. Capacitor A is the familiar ceramic variable as made by Erie or Centralab. Adaptable for either receiver or transmitter tuning, they come in ranges from 1.5 to 7 mmf and up to 7 to 45 mmf. The Centralab unit is type 822 and the Erie unit is type TS-2A. B shows the Erie type 557 which is a very small and lightweight trimmer. This type may be had on a plastic base as shown on the left, or minus the base as shown on the right. Good for receivers or low powered transmitters. In sizes from 8 to 50 mmf. Item C is a Centralab type 829 tubular trimmer, available in ranges from .5-3 mmf to 1.5-10 mmf. Excellent for trimmer use, it is compact, lightweight and may be mounted in a single round hole. D is the standard APC air trimmer made by Hammarlund in a wide variety of values. E. F. Johnson also make a similar type. Air trimmers of this type are recommended for transmitters, frequency meters and wavemeters. Also okay for receivers if the size and weight can be tolerated. Type E is a Hammarlund MAPC model. This is a miniature version of the previously mentioned APC air trimmer. Available in a wide range of values. For the ultimate in subminiature transmitter design we have the E. F. Johnson model M, as shown at F. This ultra compact and lightweight air trimmer comes in four sizes in the conventional single type, ranging from a maximum of 5 to 20 mmf. Also made in a differential and butterfly model for builders having special applications for these types. 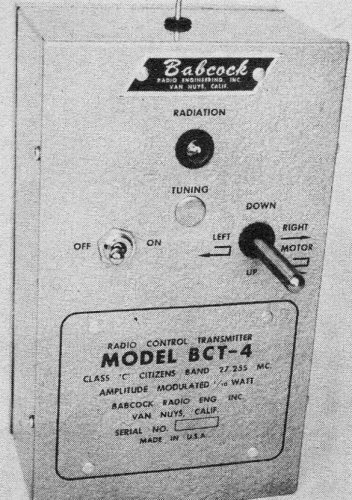 All of the above mentioned variable capacitors may be obtained from your local radio supply shop, although some may have to be specially ordered. Control Research, Berkeley Models, Ace Radio Control, Essco and other RC suppliers can also serve you with some of these items. The latest news in batteries is the new Burgess 1-1/2 volt Heavy Duty Industrial cell. Available at present in the D size, this cell is made of a completely new, artificial mix. This revolutionary mix increases shelf life, life under service and the recuperative powers of the cell. This new cell should be a "must" for Large B and Class "C" RC models. Available through your local Burgess dealer or distributor. Electronic Specialty Supply Company of 58 Walker St., New York City, now has a new relay tube for our two-tuber set. Known as the MPC-1, this tube has a 40 mil filament and will pass over 3 mils through a 5,000 ohm relay. Similar in size to the familiar XFG-1, this $1.95 hard tube should increase the relay tube life to near infinity, barring breakage, and also give increased efficiency. As this goes to press we learn of a new producer of tuned reed relays. Radio Control Specialties of 377 W. Eighth Street, Eugene, Ore., should now have these ready for the market. Babcock Radio Engineering Co., Van Nuys, Calif., does it again. A newcomer to the model radio control field, this firm has long been a supplier of target drone equipment to the government and builders of commercial and industrial receivers and transmitters. Their latest addition to the success of RC work is a three-channel unit giving rudder, elevator and engine control. The 2-7/8 x 3 x 5 in., 16 oz. receiver has a range of two miles, is virtually crash-proof and features all the same type tubes for ease of replacement, and its "one adjustment" tuning feature makes it the acme of simplicity to operate. The hand-held transmitter features a four-position control stick, to give realistic "feel" to the operator. 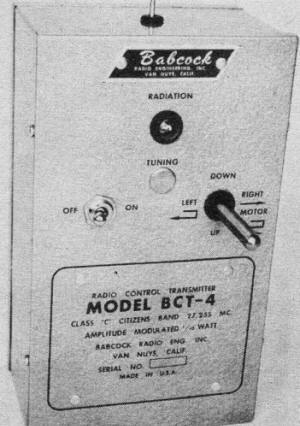 The transmitter also features one tuning adjustment and a radiation indicator. The 300, 720 and 1,620 cps tones are amplitude modulated up to 85 percent. For the rabid RC fan and builder this looks like the ultimate in model radio control units. The pictures show the excellent design and workmanship on the Babcock BCR-4 and BCT-4. We've just received the latest catalogue sheets from Ace Radio Control of Higginsville, Mo., and find they are ideal advertisements for the novice in the field. Photographs of all kits offered give the buyer a first hand picture of what he is getting. Not a bad idea. William Rassbach of 624 Clyde St., Pittsburgh, Pa., dropped us a short line on the doings of a few of the members of the DC/RC club. Leo Miller controls his 5-ft. Arden .199 powered job on 220 mc. While on the subject, Carl Hermes of Arlington, Tex., wants some information on 220 mc RC equipment. This might be a chance for the DC/RC boys to do a little education work on a frequency other than 27 or 52 mc. Jim Reed, of the same club, has K & B .15 powered semi-scale Cessna L-19 with a three-tube receiver; operates proportional control on the rudder and elevator. 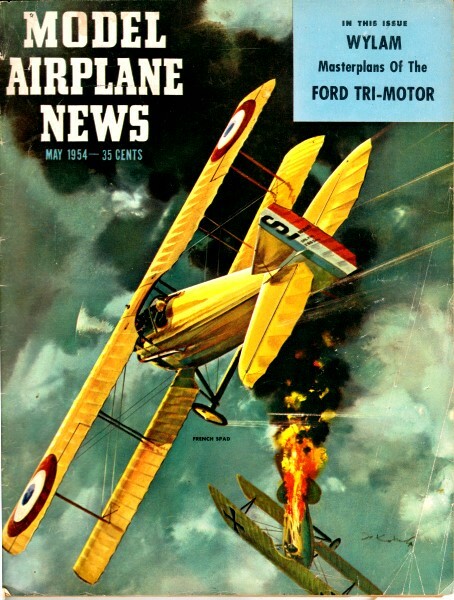 Aeronca-type Live Wire Champion, 56 in. span, 600 sq. in, area, for engines of .15 to .19 displacement. Has both elevator and rudder controls. While not exactly concerning club news, we did talk to Art Lagrange of Wappingers Falls, N. Y., recently regarding the use of a gas tube as the first stage of a reed receiver. Seems as though Art has a very nice receiver using this arrangement which also operates a Sigma relay on the RF carrier. This is in the plate circuit of the RK-61 in the first stage. 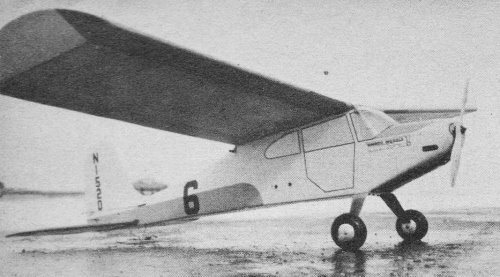 To go one farther, we note in the British publication Aero Modeller that one of their chaps has operated an ED reed bank from a single XFG-1 and has obtained about 1,000 ft. range. From Albuquerque, N. M., we are reminded of a very important safety item. This concerns the sharp end of the vertical wire antennas emanating, unsuspected, from the camouflaged confines of your model. Personally, we bend a 1/4 in. diameter loop on top of the antenna, but it just never occurred to us to mention it before. A small balsa sphere, painted yellow, red or orange and attached to the tip end also should be satisfactory. Let's keep looking into the safety angles; they're important! It seems that we're missing out on some top notch information when we fail to hear from RC clubs within large engineering organizations. We know they exist but for some odd reason they keep to themselves. How about hearing from some of these groups? One thing we've found out recently is that too many individuals or groups are hesitant about divulging their "secrets." During our many years of modeling and manufacturing, we've found this to be one of the quickest ways to have a good thing die a natural death. Get your idea into print and it will help both you and the reader. The Radio Control Club of Detroit is out to make the Detroit area the RC spot of the East. They have a fine perpetual trophy. All persons interested, no matter where they live, are urged to write to E. S. Kratzer, 1112 Book Bldg., Detroit, Mich., for information about this year's meet. The novice flier is urged to attend, along with the expert, since there will be separate groupings for each class. In this way the beginner has a real chance. An excellent idea to get RC contests rolling, and not have them just another addition to a larger contest.